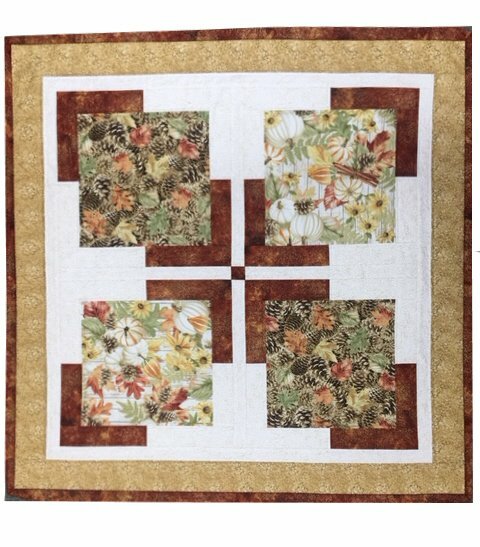 This kit contains all the fabrics + pattern to create this lovely fall-themed table topper/ wall hanging. The feature fabric has white pumpkins, fall leaves, pine cones, sunflowers and cinnamon sticks - all with accents of metallic gold. Coordinating fabrics also are accented in gold and create this striking design. 100% cotton fabrics. Backing and binding are included. Finished size approximately 32.5" x 32.5"